KP Government Front-runner in Quality of Governance with Positive Ratings on 18 out of 28 Indicators; Punjab trails with 8 positive Indicators: PILDAT releases second part of its annual Public Opinion Poll results. 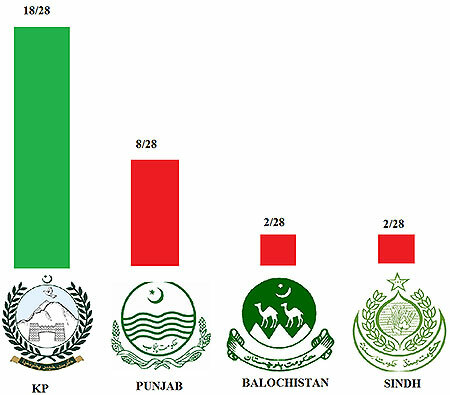 However, with reference to nationwide public opinion on the overall popularity of the Provincial Governments, the Punjab Government garners the highest Approval Rating at 76%, followed by the Government of Khyber Pakhtunkhwa at 38%, Government of Sindh at 30% and the Balochistan Government at 28%. Results show that the performance of the Provincial Chief Ministers closely follows the performance of the Provincial Governments as well. 3 The detailed Provincial scores for Governance Indicators can be seen in Table 1. Results of the poll reveal that all Provincial Governments rated negatively on Poverty Alleviation, Energy Production and Management, Investment Friendliness, Tax Collection, Management of Unemployment, Quality and Independence of Civil Service, and Clean, Efficient and Economic Public Procurement. The public has largely seen the governance performance of the Federal Government negatively. 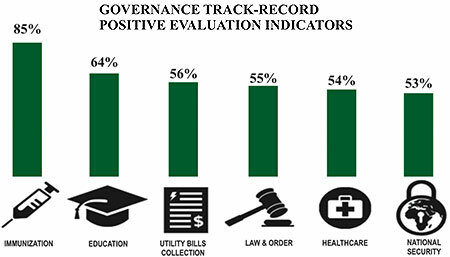 Out of the 30 core Governance Indicators, the Federal Government’s governance performance has been positively evaluated only on six indicators: Immunization of Children (85%); Education (64%); Collection of Utility Bills (56%); Law and Order (55%); Healthcare (54%) and National Security (53%). 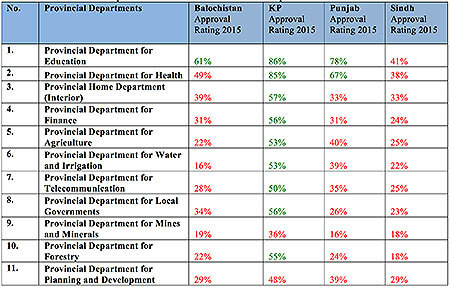 In all the remaining policy areas that were included in the survey, the majority opinion was one of disapproval on indicators of Poverty Alleviation (28%), Transparency (30%), Management of Unemployment (25%), Quality & Independence of Civil Service (26%), Merit-based Appointments in Regulatory Bodies (28%), Devolution of Powers to Lower Tiers-Establishment of Local Governments (29%). 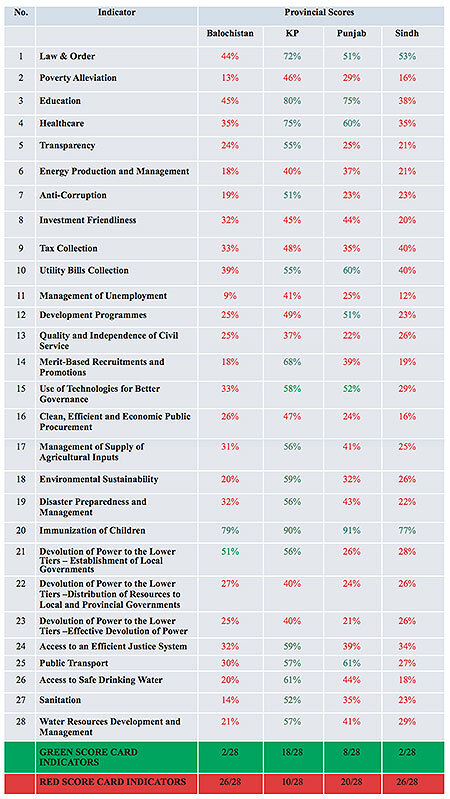 Detailed public Approval Ratings on the Indicators of Federal Government’s performance are given in Table 2. At present, Pakistanis appear uncertain about the trustworthiness of the National Accountability Bureau (NAB), which registered a low Approval Rating of 30%. Only 32% of the respondents positively rated trust in Government Officers. 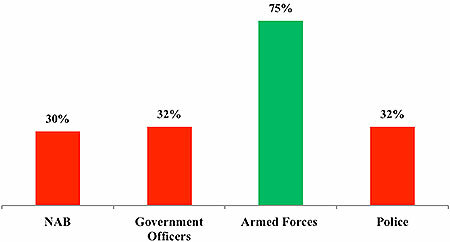 The Armed Forces emerged as the most trustworthy institution with an Approval Rating of 75%, with Police considered the least trustworthy institution at 32%. Respondents were asked to evaluate the performance of the Federal Ministries in the two years of the Federal Government in power. Their responses are recorded in Figure 5 below. 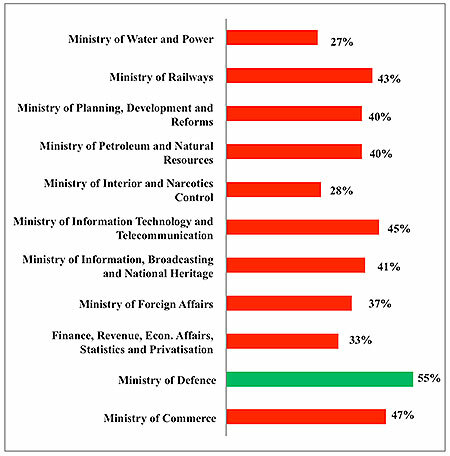 Majority of the respondents negatively evaluated the performance of the Ministries with the exception of Ministry of Defense, receiving an Approval Rating of 55%, followed closely by the Ministry of Commerce at 47%. The Ministry of Water and Power received the worst evaluation in the nation-wide opinion poll at 27%. The Ministry of Railways and Ministry of Information Technology and Telecommunication received Approval Ratings of 43% and 45% respectively. Respondents of PILDAT’s nation wide Governance poll also evaluated the performance of the Provincial Departments in the past two years. The responses can be seen in the Table 3 below. When asked about the biggest identified challenge for the Country, majority of respondents (25%) from all over Pakistan identified ‘Energy Crisis’, as the biggest problem. ‘Unemployment’ came in second, with 19% respondents identifying it as a serious challenge for the Country. The problem of ‘Maintaining Law & Order and Peace in Light of Terrorism’ ranked as the third biggest problem, identified by 15% of the respondents, followed by ‘Poverty’, identified by 12% of the respondents. Surprisingly, the problem of ‘Corruption’ was not perceived as a major issue by Pakistanis; with only 3% of the representative sample of the Pakistani public considering it as a major issue facing the Country in 2015. In the survey, Prime Minister Nawaz Sharif enjoys a high positive rating of 75% among adult men and women from across the four Provinces. Compare this with the performance of the Federal Government led by the Prime Minister on which the national public has provided a very poor rating. 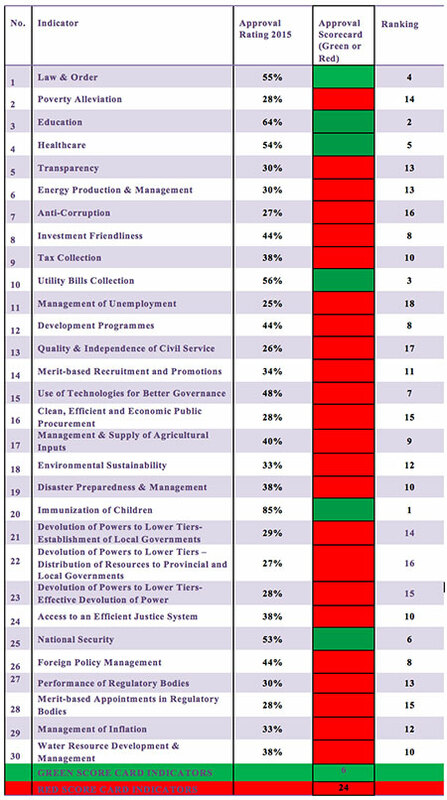 From 30 Indicators on which respondents from all across Pakistan were asked to rate the Federal Government’s performance on governance, only 6 indicators receive a favourable view of performance while on a majority of 24 indicators, respondents’ view of Federal Government’s performance appears as ‘Poor’ or ‘Very Poor’. This apparent dichotomy is explained by two factors: whereas in public opinion, performance of the Federal Government on key Governance Indicators is largely perceived as rating on ‘Resolution of Problems’, his personal popularity conveys he is regarded as having the capability to resolve the problems of the Country. It is worth pointing that this gap between ‘Approval Rating’ and ‘Performance Rating’ can be expected to be reconciled, i.e., Approval Ratings may also plunge if current public expectations from the Prime Minister collapse. In other words, Prime Minister Nawaz Sharif’s Approval Rating stands on very shaky ratings on performance on Governance and therefore intrinsically unstable. While the Approval Ratings for Prime Minister Nawaz Sharif suggest that the majority of the respondents (75%) positively evaluate him, trust in his potential of resolving problems in the Country gives a more detailed outlook on the Prime Minister’s popularity among the Pakistani public. Survey results show a majority of respondents (61%) are optimistic about the current Government’s capability, under Prime Minister Nawaz Sharif to improve peace and stability in Pakistan, 56% of respondents are optimistic about improvement in economy, 54% are optimistic about controlling terrorism in the future. Only 32% remain hopeful about the Government’s ability to generate employment opportunities and 29% believe that Nawaz Sharif’s Government can rectify the issue of poverty. Moreover, less than half of the respondents (38%) believe the PML-N Government can improve relations with the United States, 29% remain hopeful about improvement in relations with India and only 36% believe that the incumbent Government has a chance of improving relations with Afghanistan. Compare this to Mr. Imran Khan’s National Approval Rating vis-à-vis public perception on performance of his party’s Government in Khyber Pakhtunkhwa. The PILDAT survey of public opinion across Pakistan reflects that Mr. Imran Khan’s popularity is less than Mr. Nawaz Sharif’s (49 % vs 75 % respectively). Interestingly Mr. Imran Khan’s Approval Rating has declined over the past one year and one possible watershed has been more than 100 days of Dharna Politics during this time period. The hypothesis for this decline in Approval Rating can be explained by a phenomenon of ‘Polarised Elite and Non Polarised Pakistan.’ It appears to us that PTI, due to the politics of agitation, epitomised by Dharna in Islamabad, absence from National Assembly and almost continuous politics of protest at National and Provincial level has polarised certain segments of society, i.e., the ‘Urban Educated Elite’ living mainly in metropolis cities but also spread across the country. However, the wide majority of the country (also dubbed as the silent majority) does not fall into this demographic and they have not approved of the ‘Polarising Politics’. At some sub-conscious level the political confrontation (not contest) reminds them of 1990s agitation politics and its fruitless results for public at large. Had the mainstream public opinion supported the polarizing politics as the elite in the country have done, the outcome of the survey with respect to the Approval Rating may have been sharply different.